“Specimen of Ornamental Typewriting. Written on a Remington No. 5 machine by Franklyn T. Rudiger, South Omaha, Neb.” From the Phonographic Magazine, April 1, 1893, Vol. 7, No. 7. I was a five-year-old boy, thumbing through a K-Mart catalog when I came upon the electric trains page. Glorious towns lay before me, scenes encircled by HO gauge track that seemed to go nowhere, but everywhere. All I wanted for Christmas was an electric train. My parents looked at me. Was there anything else I wanted? Perhaps Santa would think I was too young for a train. I couldn’t believe my ears. Santa… dear old St. Nick… the man whose lap I sat in and whispered my precious request (he never said anything about my being too young)… this man whose sole job in the world is to grant little children their wishes, would deny this erstwhile little child his ONE, SINGLE desire? I was confounded. Such a Santa did not exist. That Christmas there were many fine gifts under the tree… but no train. I began to question the meaning of the universe. But I was a child of faith. Each year, I wrote to the jolly old denier of gifts that ALL I WANTED WAS AN ELECTRIC TRAIN. I knew I was risking much, for if my letter contained no other requests there was a possibility that no toys would find their way under the tree for me. But Santa was not vindictive. Each year there were many other toys (some that I secretly desired) for me under the tree. Santa played a mean game — “mean” in the sense of shrewd — and he was a crafty old man who knew how to give and how to take away. He bested me each year. In my ninth year (O, a glorious year it was), there came the miracle of the train. I had written a long letter to St. Nick, outlining my argument for the electric train and somehow I prevailed. I was now old enough for an electric train. (Yes, I placed my hand carefully on the track, and I did not get electrocuted — that was a myth.) I was now old enough to clean and maintain a model railroad. And round and round the train spun. I was enamored. I do not believe that I ever thanked Santa for the set, for the year afterward I asked for another set. And the year after, a Santa Fe engine… but, thanks, Santa. You’re a swell guy. Merry Christmas, everyone. 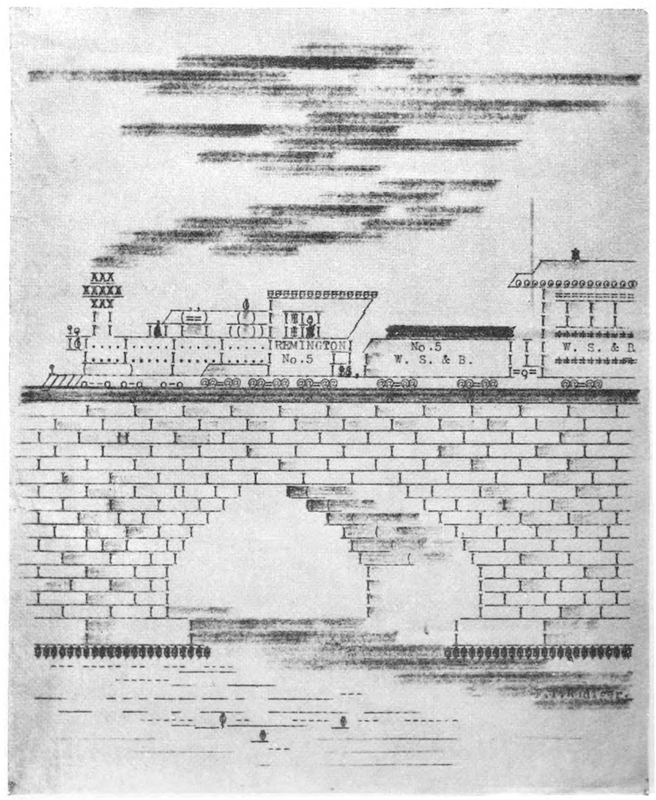 Included in this post is one of the earlier examples of typewriter art (the earliest? ), a “No. 5” train, created by Franklyn T. Rudiger, a renowned stenographer. Commenting on his work, The Stenographer wrote: “Mr. Rudiger has executed some of the handsomeness specimens that we have ever seen of typewritten work, and is certainly an artist in the line.” Rudiger worked for the Cudahy Packing Company in South Omaha, Nebraska.